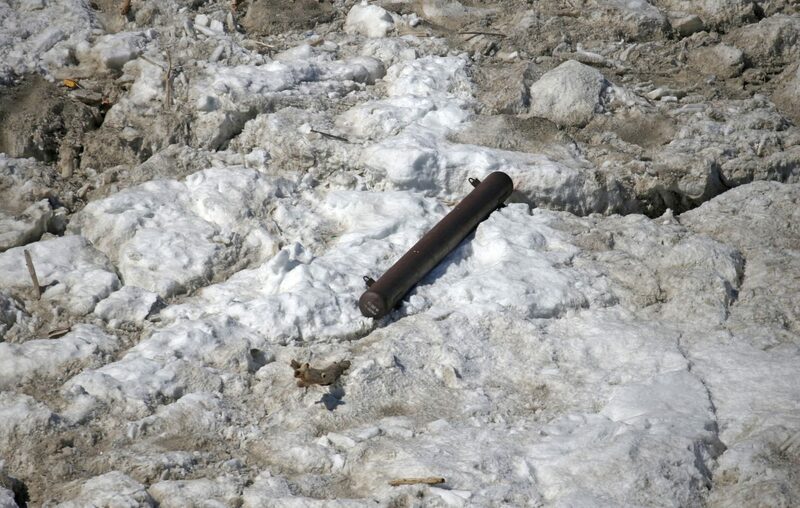 What's that metal thing on the ice below Niagara Falls? 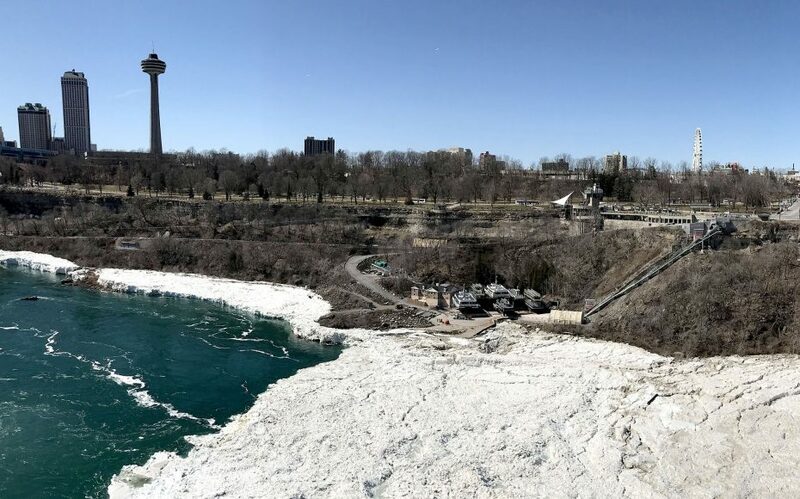 Anyone looking down from the observation deck at Niagara Falls State Park can spot it amid all of the ice below Niagara Falls: a piece of the Niagara River ice boom. The 30-foot brown metal shaft is a pontoon, one of 196 attached to the boom, said Lou Paonessa, spokesman for the New York Power Authority. In all, about a half-dozen pontoons came off the boom at different times this winter. "It's unusual for them to make it all the way over the falls, but it's not the first time it ever happened," Paonessa said. Normally, Paonessa said, breakaway pontoons become stuck somewhere along the riverbank and are recovered by workers aboard a NYPA tugboat. Recovering the one below the falls poses a bigger challenge. "I don't know how we're going to recover that one," Paonessa said. "We'll probably wait until it's easy access from a boat or a tug." The Power Authority installs the ice boom each winter to reduce the flow of ice down the river, protecting the intakes that send water to the hydroelectric turbines on the U.S. and Canadian shores. "The ice boom is really a bunch of steel cables, kind of like a charm bracelet," Paonessa said. "The pontoons are like the charms on it. They can dislodge, and frequently do. Usually a few come off every winter, but the boom still would be relatively intact, like a bracelet around your wrist." 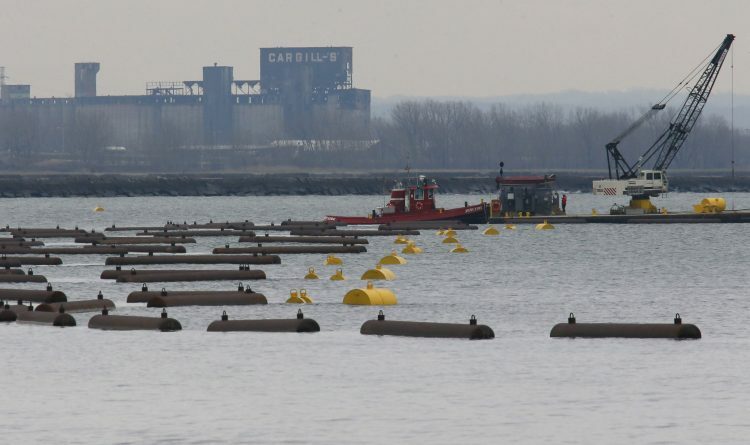 Sixteen mini-pontoons, each 15 feet long, are on the four spans of the ice boom installed between Buffalo Harbor's inner and outer breakwaters. None of the 15-footers broke off this year. The rest of the 8,800-foot barrier uses the full-size pontoons, each 30 feet long and 30 inches in diameter, as the main components of the remaining 18 spans. Each span has as many as 10 pontoons, and they float. Markings on the pontoon at the bottom of the falls show it was first placed in service in 1997, Paonessa said. The boom is anchored to the bottom of Lake Erie at 400-foot intervals by 2.5 inch steel cables. The boom stretches across the outlet of Lake Erie, just southwest of the City of Buffalo’s water intakes. High winds and ice put heavy pressure on the cables. "Some of the span cables, one or two of them will break per year. That's not unusual," Paonessa said. "There was a cable anchor to the (lake) floor that broke (this year). That's unusual." Crews install the boom each winter when the lake temperature falls to 39 degrees, but no later than Dec. 16. This season, installation began Dec. 13. The average boom removal date is April 6. "There's still probably about 800 square miles of ice behind it, and it doesn't come out until there's less than 250," Paonessa said. The dates are chosen by the International Niagara Board of Control, a subsidiary of the International Joint Commission, the U.S.-Canada agency that handles Great Lakes issues. Thanks to the boom, there was no ice damage to the Niagara Power Project water intakes this winter, Paonessa said.